The closing chapter of the enormously successful Hangover series is set to arrive in theatres next week. Once that final instalment lands, there’ll be an opening in the cinematic calendar for a tag team of blokes hell bent on getting into trouble. The people behind Last Vegas has come to steal that gauntlet of debauchery and in this first teaser trailer, we get a good indication of what’s to come. It’s clear that the male ensemble comedy is a genre that’s not ready to keel over just yet. From Jon Turteltaub, director of National Treasure, Last Vegas offers a look at a gaggle of Oscar winners getting hammered. The film no doubt was greenlit with its cast already attached. A premise that treads on the topic of a bachelor party in Vegas is hardly new territory. 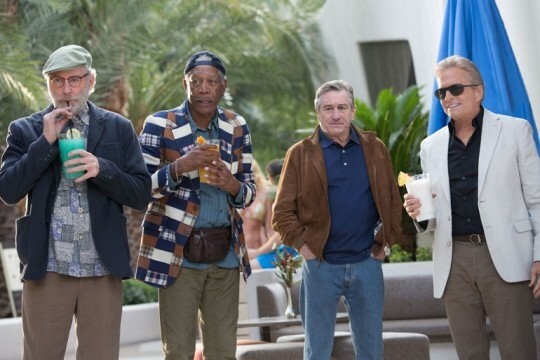 With Robert De Niro, Morgan Freeman, Michael Douglas and Kevin Kline in the roles of four buddies who later in life head to Las Vegas for a stag weekend, their presence is ultimately what makes this trailer fun. From this teaser we can surmise that all four actors look like they’re having an absolute blast. All of the leading cast involved have ventured into comedy before. The sparks flying between the four stars knocks the film out of its limitations as your typical fish out of water caper. Following the announcement of Douglas’s upcoming nuptials, the gang of four pals unite in Las Vegas for a final hurrah. Cue the drinking, cracking onto women half their age, dancing and spouting gibberish after too many vodka and Red Bulls. The screenplay was penned by Adam Brooks and Dan Fogelman, who’ve made names for themselves with romantic comedies. It’s unlikely the film will veer off into any Oscar-winning soliloquys, but that’s not what you want from this kind of outing is it? Last Vegas arrives in cinemas on November 1st.